As a blogger, I usually back off and don't join contests such as this one, you guys might think it's unfair and rigged (if I win) but it's not, honestly speaking. But this time, I'm not backing off. My laptop has been dying a slow death and I really need a new one so talo-talo muna (:P). • Winners will be announced on September 12, 2013, 12:00 noon. • Claiming of Shopping Certificates will be on September 13, 9:30 am at the SM Store MOA Prestige Lounge. • Validity of Shopping Certificates is from September 13-15, 2013 ONLY. • Promo runs from September 2-12, 2013 only so tweet us now! 1. 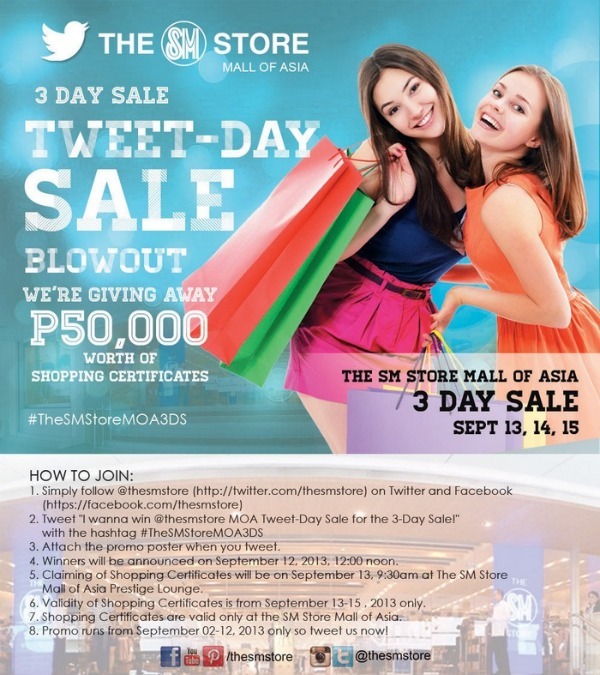 Simply follow @TheSMStore (http://twitter.com/thesmstore) on Twitter and Like The SM Store (http://www.Facebook.com/TheSMStore)and SM Shoes & Bags on Facebook (http://www.Facebook.com/SMShoesAndBags). 2. 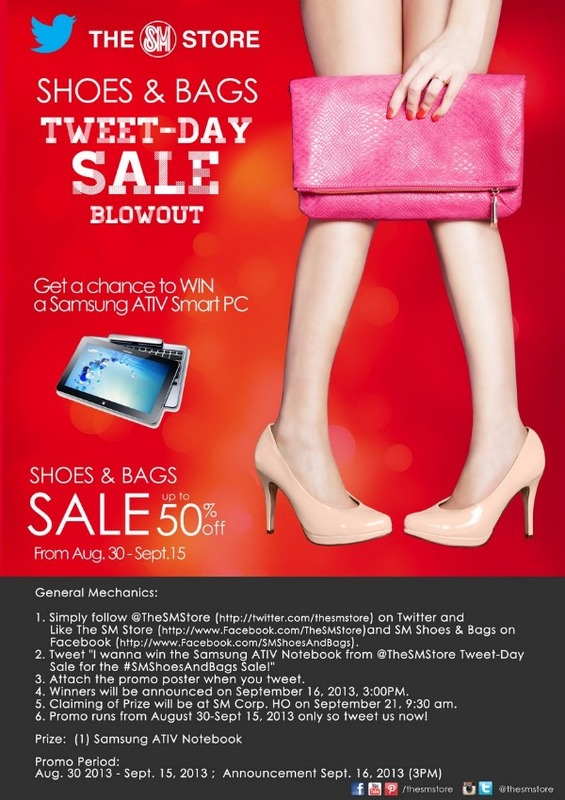 Tweet "I wanna win the Samsung ATIV Notebook from @TheSMStore Tweet-Day Sale for the #SMShoesAndBags Sale!" 3. Attach the promo poster when you tweet. 4. Winners will be announced on September 16, 2013, 3:00PM. 5. Claiming of Prize will be at SM Corp. HO on September 21, 9:30 am. 6. Promo runs from August 30-Sept 15, 2013 only so tweet us now! ahaha,wag na po kau sumali,para may chance kaming mga pulubi.hihihi..I remembered Ms. Ana Gon won also from SM TWEET DAY SALE.